Bookish & Not So Bookish Thought is a weekly men hosted by Christine over at Bookishly Boisterous, where we post things that are on our minds. Let’s give it a whirl! 1. I think I am a little too excited to see Catching Fire. I offered to take my daughter and all her friends, with the stipulation that I am staying to watch the movie with them-not cool when you are 13 years old. 2. Everyday my son comes home from school, gets a snack (usually what a normal person would consider a whole meal), and puts on Bizarre Foods with Andrew Zimmer. It is disgusting. How can anyone eat while watching that?? Maybe I should try to eat all my meals with that on in front of me- finally lose those last 5 lbs that have been clinging to me. 3. One year ago Sandy came barreling through here- and we STILL have huge portions of the gigantic trees that fell along the perimeter of the yard. I know hubby is busy, but a whole year?? 4. I started reading The Shining this week. My very first King novel. WHY WHY WHY did I begin it a few days before Halloween??? I am the biggest wimp ever, so what the hell was I thinking? I keep the light on in the house- all of them, even the garage light. Don’t get me wrong- I am loving the book and will probably run out and get another of his- but it is freaking me out a bit. I won’t read it when I am alone in the house- the dogs are here, but I don’t think they would wake up if a dead lady from the bath tub comes to get me. They wont hear her over their own snoring. 5. I finally hit the 4 mile mark in my running (I am old and pathetic- just started running again after 30+ years of not). I celebrated with a $100,00 bar. Now I need to run 10 miles. 6. My daughter is so excited to finally have Halloween this year, as it has been cancelled the past two- Snowtober in 2011 and Sandy in 2012- and of course it is raining. Can’t catch a break. It’s not the same trick or treating with an umbrella. 7. I think I might finally take the plunge in the next few weeks and join The Classics Club. I have been thinking of doing it for a while and I think I need to just jump in. 8. I am a bad mother. My daughter was in the living room, studying on the computer while hubby and I watched the World Series. 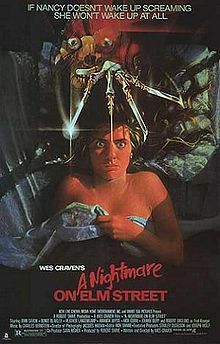 Just to screw with her, I put on A Nightmare on Elm Street (she is my daughter-a total wimp). She ran out of the room so fast, the chair she was sitting on went flying. I laughed. Bad mother. I think this is supposed to be a list of 10- but that;s all I got. Hope you all have a Happy Halloween!! 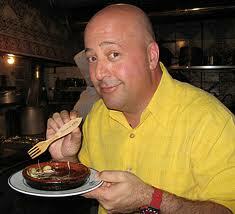 Awesome post, had me chuckling through the whole thing :)I agree about the bizarre food,,ew. Happy Halloween!! Happy Halloween! I loved this post. Hopefully the rain clears up soon for the trick or treaters. 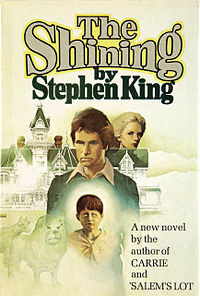 I hope you enjoy The Shining, it’s scary in parts, but I think it’s one of King’s best. It is hard to believe Sandy was one year ago. Thanks- finished the book yesterday- very apropos for Halloween! It was great! I STILL have nightmares about Nightmare on Elm Street (and I saw it in the 80s!). I only put it on as a joke- I would never watch it-hate scary movies! Hope you had a fun Hallowe’en! Hee! The Shining scared the crap out of me, too. Big time. Congrats on meeting your latest running goal! Loved the post! Stephen King is too scary for me; I don’t even try anymore. Hope you had a happy Halloween despite the rain! Thanks- this was my first King, and while it scared me, I really loved the writing. I might go to the library tomorrow and see if they have The Stand-gulp! This post was hilarious! And I’m also soooo excited for Catching Fire! If I’m not mistaken, it comes out on my b-day, too! I am going to reread the book, though before seeing it! Thanks- I love the trailers that have been on tv! Thanks- I love the Linky party- when do you usually put it up- Sunday or Monday? Sunday. I try to put it up right at midnight! 1. AHHHH! 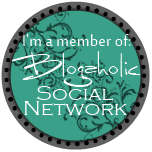 You changed your blog theme- I LOVE! Thank you- needed something different. 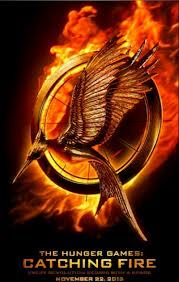 I can NOT ait for Catching Fire! 😦 😦 I know! I’m going by myself the first time- & just want to drink my strawberry slush and eat popcorn in peace while I sit back & enjoy this cinematic adventure!